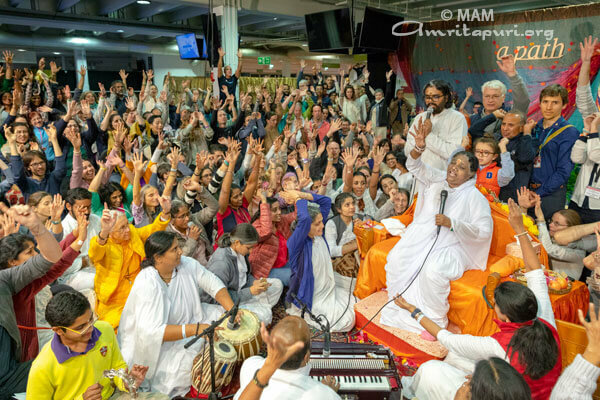 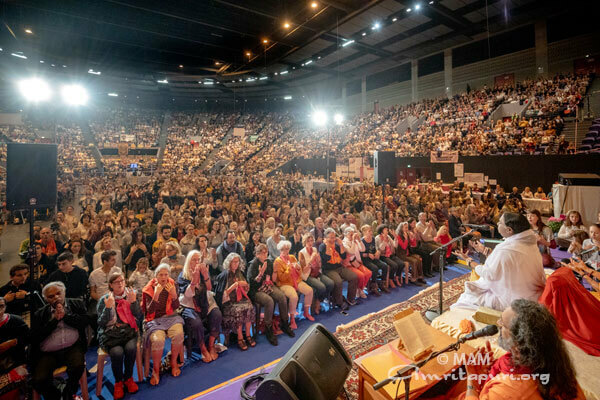 The final leg of Amma’s 2018 European Tour saw devotees from all over the United Kingdom, and many from all over Europe, come together to spend a final few days in Amma’s presence. 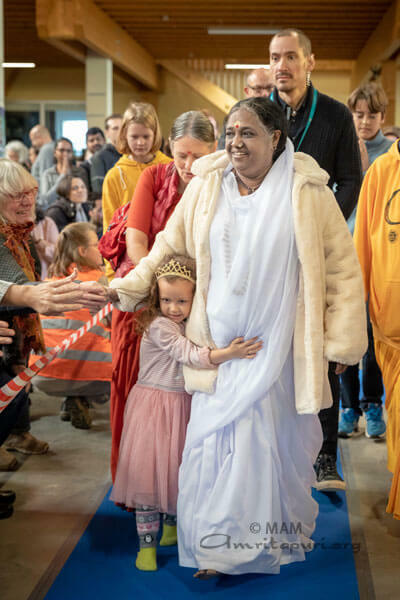 For the UK devotees, there was also a palpable anticipation in the air, for after the final Devi Bhava darshan, at long last, the dream of Amma’s UK children would be fulfilled as she visited new Amma center in Bromley, the first of its kind in the United Kingdom. 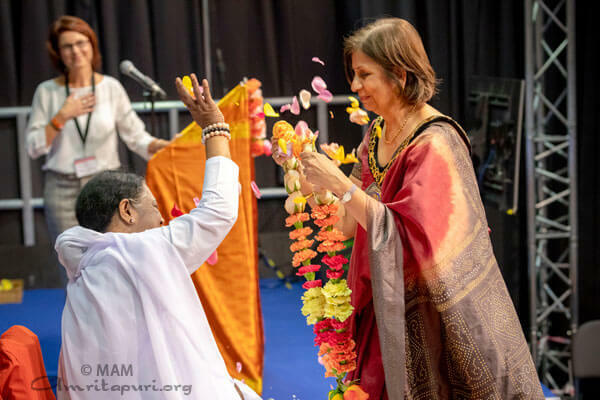 Amma was welcomed to the United Kingdom by the Mayor of the Borough of Elmbridge, Councillor Shweta Kapadia; acclaimed actress Luisa Bradshaw White. 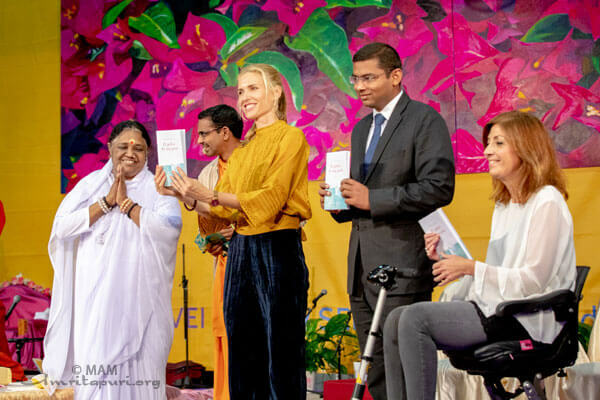 As Amma moved on to the next stop on her journey – the Abu Dhabi Interfaith Summit to Protect Child Dignity in the Digital World – it was these words that her children would carry with them into their daily lives and the year ahead, spreading the light of Amma’s love and compassion far beyond those who she was able to physically take into her arms. 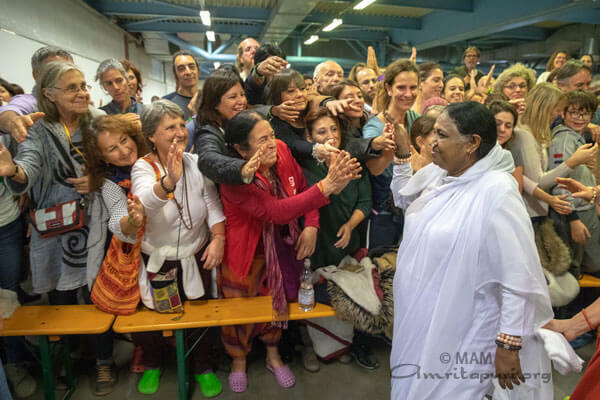 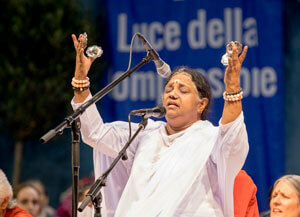 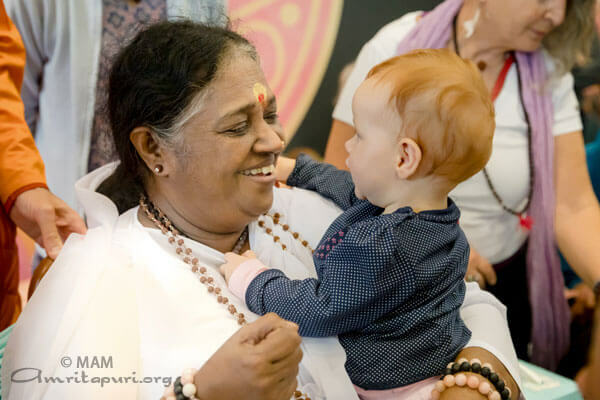 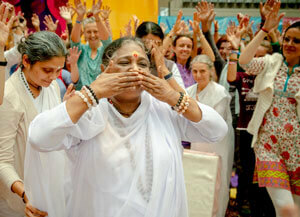 Amma’s program in the Milano region of Italy is always marked by a special enthusiasm. 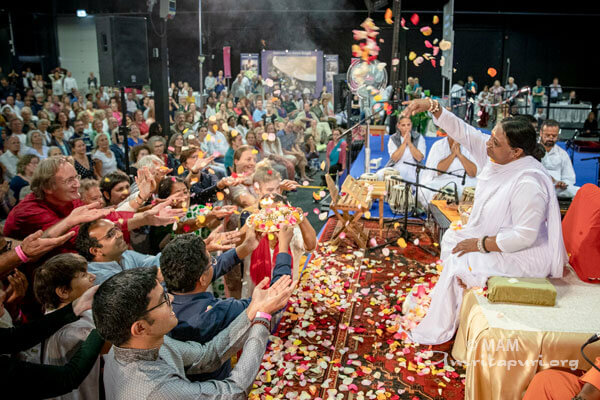 It is indeed to a sight to behold the way Amma is welcomed by the crowds as she enters the program hall. 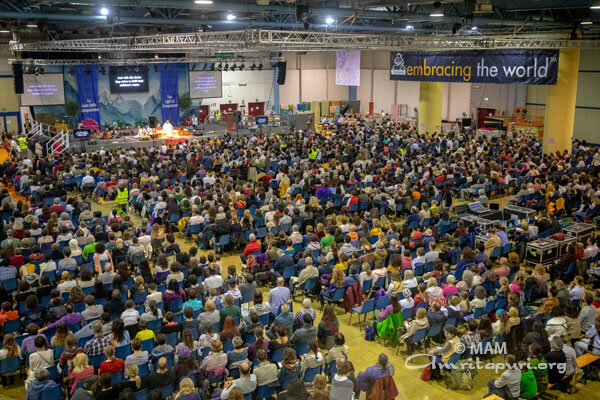 The Milano program was attended not only by devotees from all over Italy, but also by large contingents from Greece, Russia and Serbia. 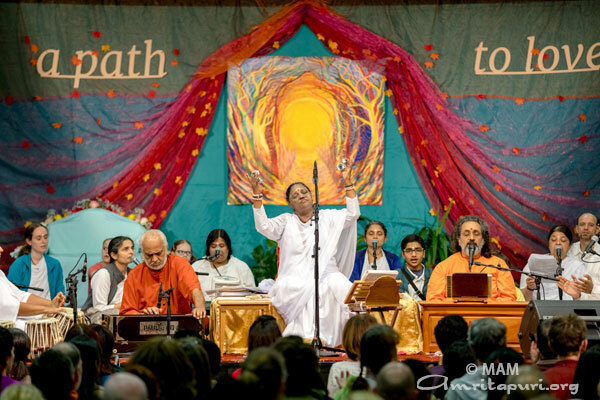 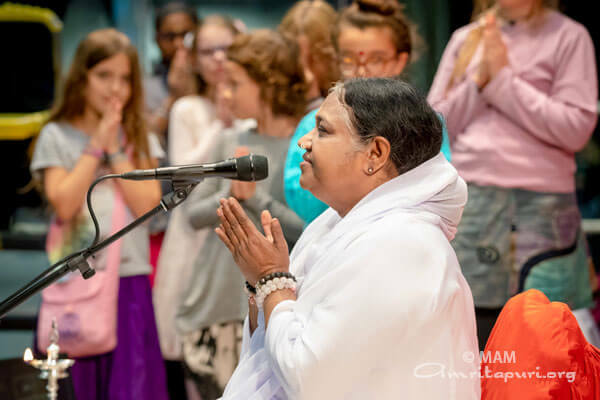 The Greek devotees shared their joy at being in Amma’s presence with an exuberant performance of traditional Greek music that brought the entire crowd to their feet. 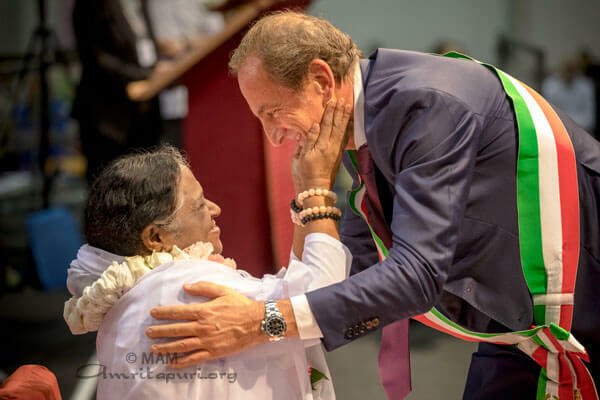 Amma was welcomed to Italy by Mr. Emanuele Antonelli, Mayor and President of the Province; On. 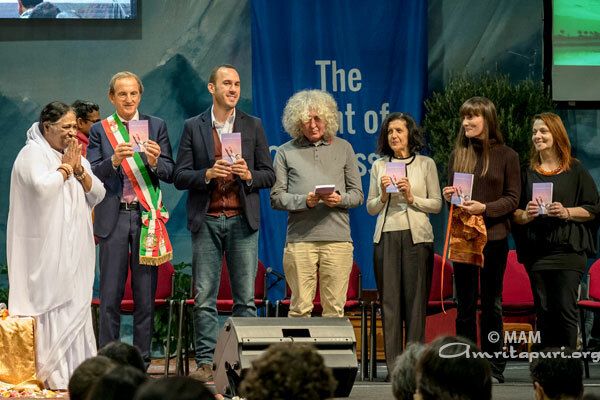 Manlio di Stefano Undersecretary of State for Foreign Affairs, and Italian delegate to the Council of Europe; Angelo Branduardi, renowned Italian folk singer; and Italian television presenter Victoria Cabello. 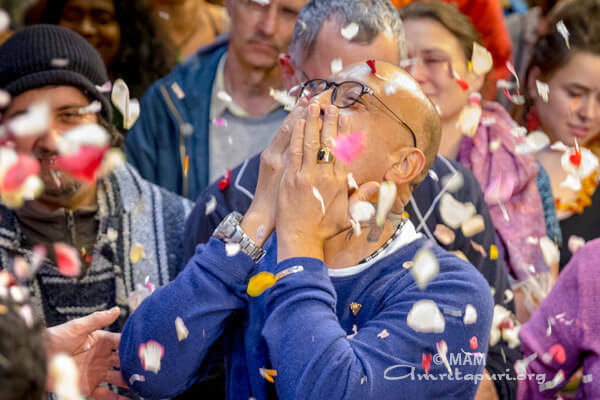 Ms. Cabello was not the only with tears in her eyes. 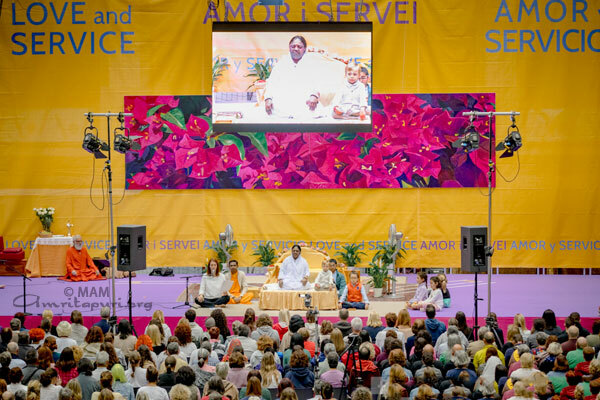 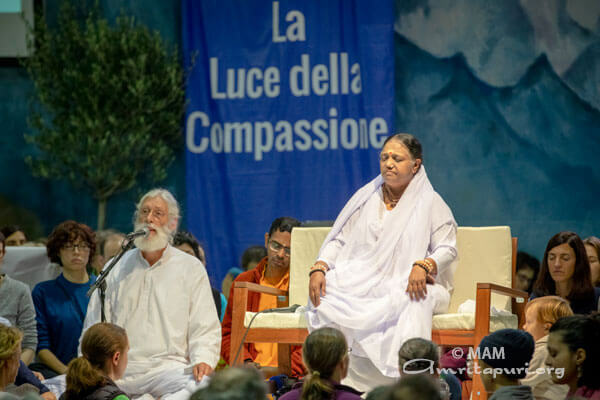 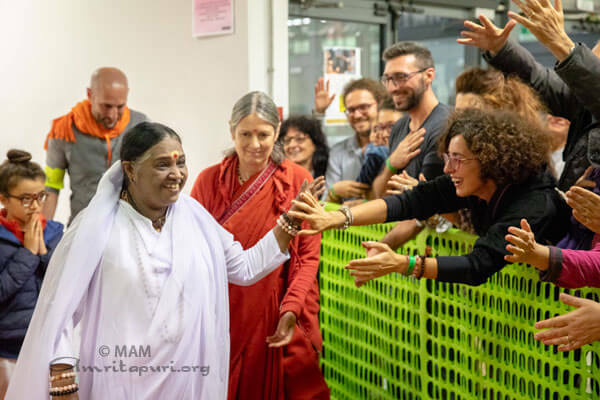 For many of Amma’s children, her last stop on the continent was the last place they would see Amma until next year, and they bid her a tearful farewell at the end of the three days of programs in Busto Arsizio. 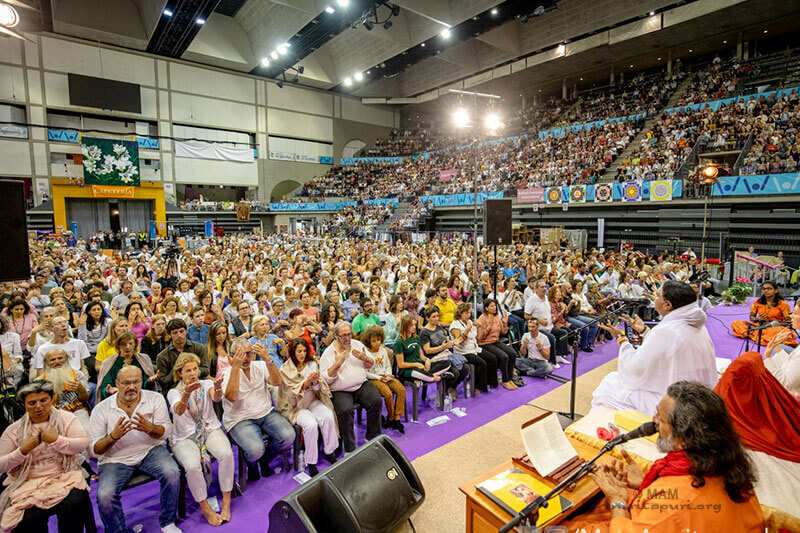 Amma’s programs in the South of France are some of the largest outside India. 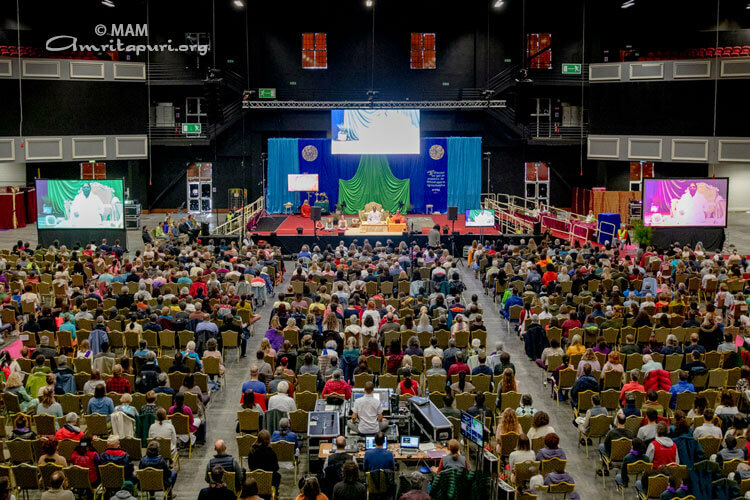 Even before sunrise, one can see long lines encircling the Omega Zenith stadium. 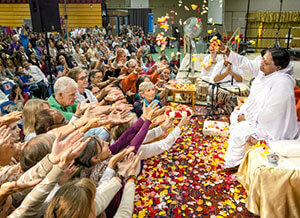 More than anything else, one is struck by the patience and love imbuing every aspect of the event. 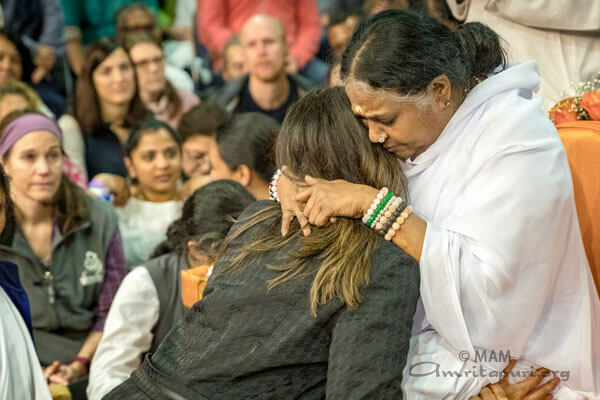 On the one side, Amma displays such selfless patience and love in tirelessly embracing one after another, no matter how many come. 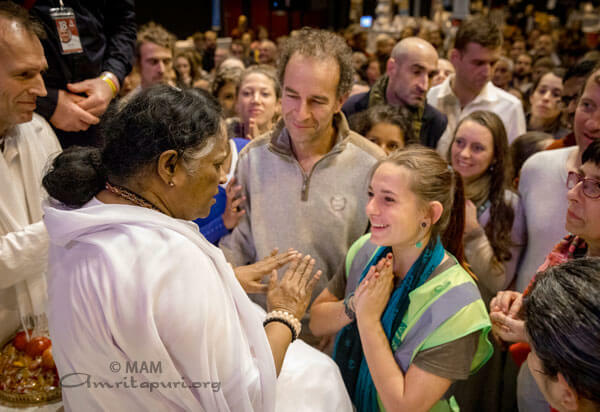 At the same time, the devotees wait with such patience and acceptance, happy to receive Amma’s blessing no matter how long it takes. 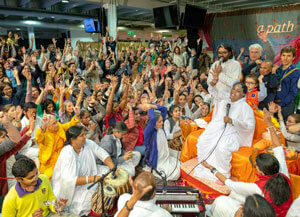 Their devotion is truly a sight to behold. 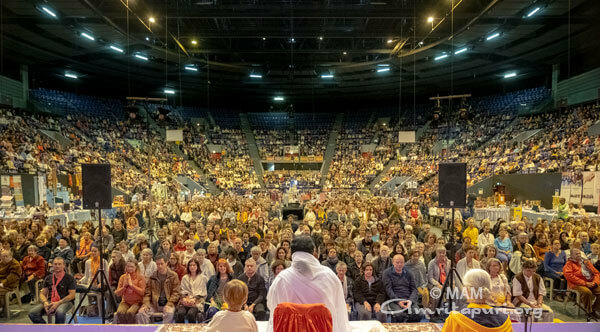 Seeing the stadium illuminated with thousands upon thousands of points of light, it was not hard to imagine that change rippling out through society, the darkness of ignorance is being dispelled by the countless lights, shining together, flickering with hope borne out of patience, and love expressed as compassion. 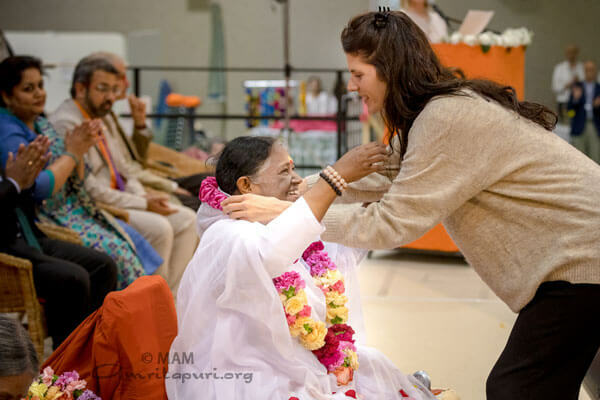 Amma’s program at M.A. 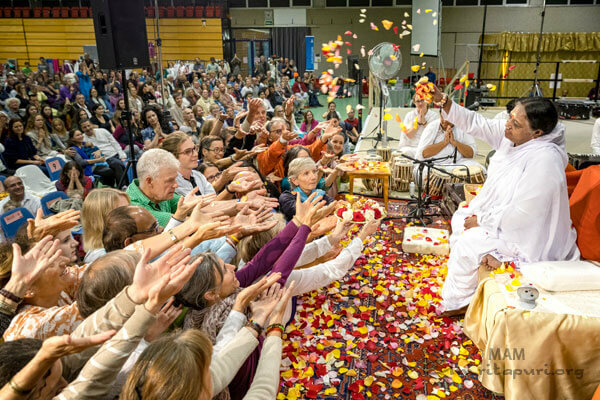 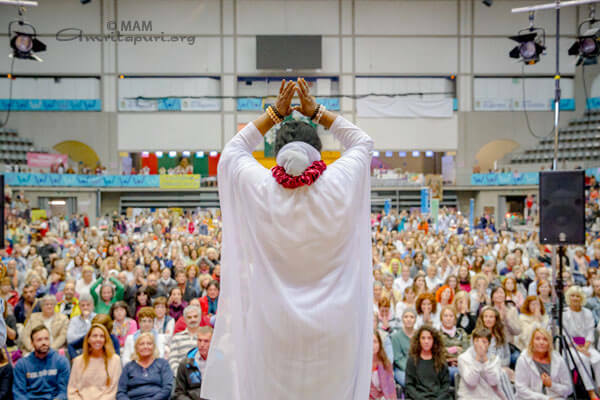 Center Germany has become an annual pilgrimage destination for Amma’s devotees all over Europe, and this year was no exception. 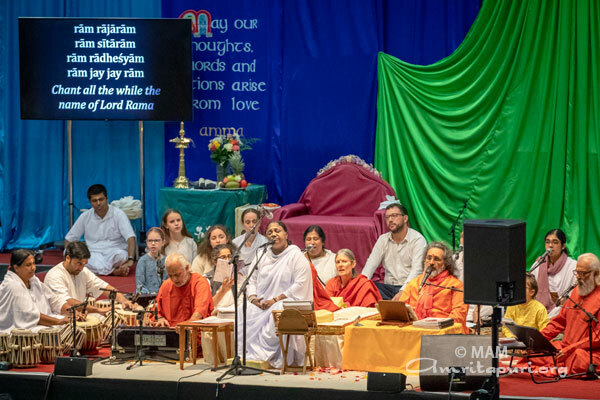 The ashram center, located in an idyllic setting amid beautiful rolling hills, provided the perfect ambience for the program. 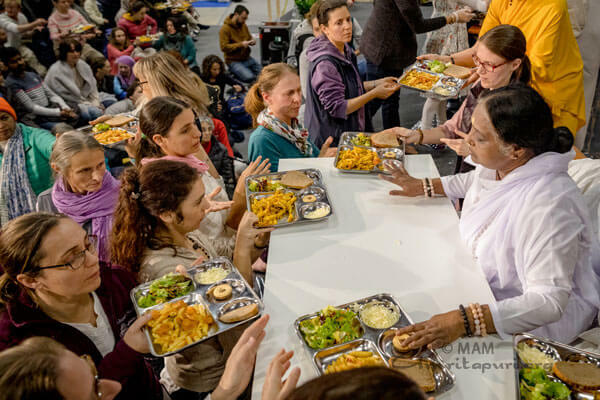 Arriving at the center from Munich, Amma took time the evening before her programs began to serve prasad and spend time with all the local volunteers, saying to their delight, “Guten appetit!” (enjoy your meal) before they began their dinner. 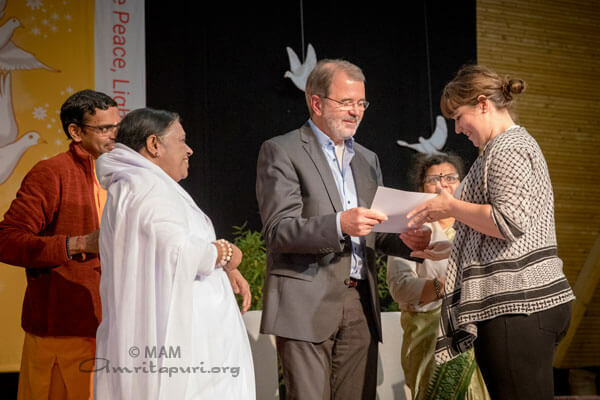 During the function, Amma also handed over EU Youth pass Certificates to 12 graduates from the Social Impact Leadership program, run by AYUDH Europe. 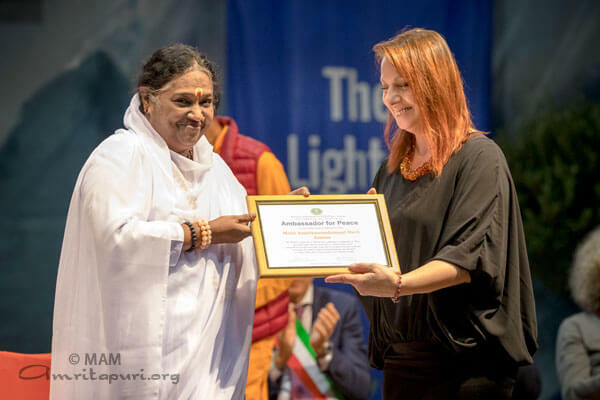 The youth from Denmark, France, Germany, Greece, the Netherlands and Spain have completed a yearlong training in leadership, project management and mindfulness. 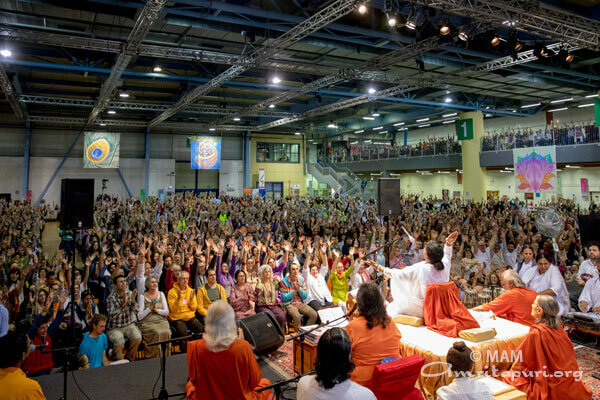 They attended three high-level seminars in Berlin (Germany), Athens (Greece) and Bilbao (Spain) and implemented one social project per country group. 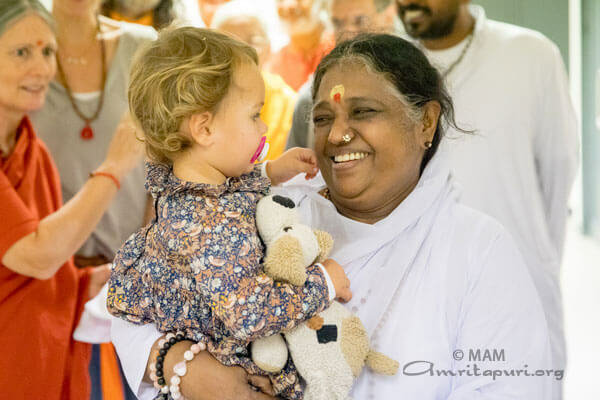 It was not only human beings but the horses living on the ranch who enjoyed Amma’s darshan this year, as she took time out to lovingly feed them. 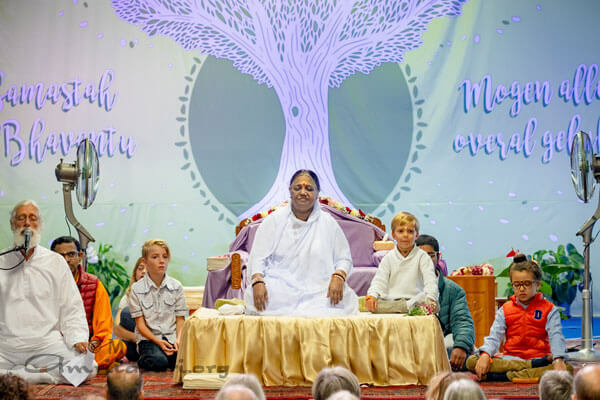 As the horses ate from Amma’s own hands, one could feel all of the surrounding nature blossoming in the light of Amma’s presence – a natural beauty imbued with the fragrance of peace, love and compassion that follows Amma wherever she goes. 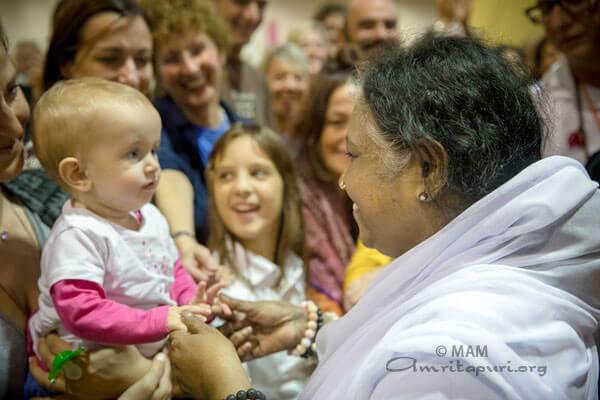 This was Amma’s first visit to Starnberg in the Bavarian region of Germany. 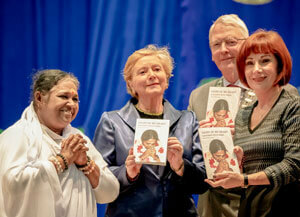 The program was held in the Biberkor Montessori School. 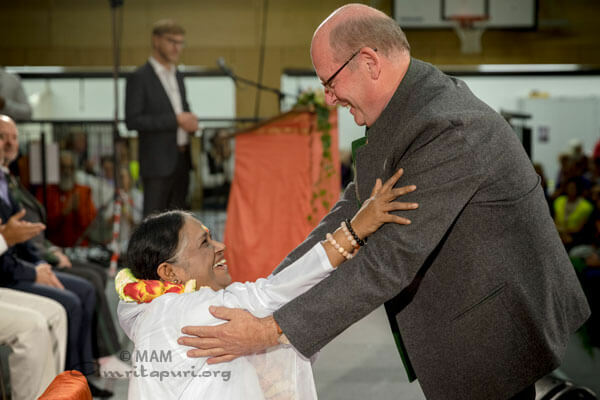 Amma was welcomed to Germany by the Indian Consul General Shri. 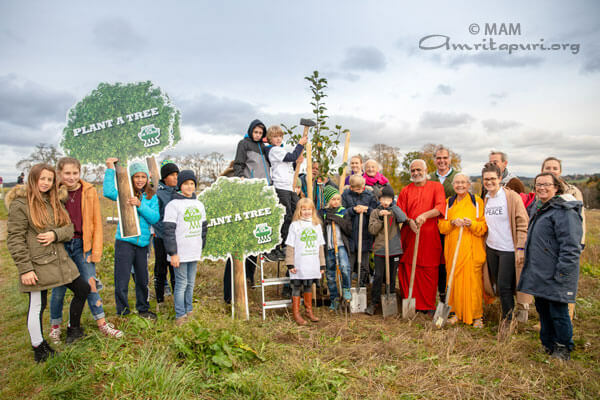 Sugandh Rajaram; Rupert Monn, Mayor of Starnberg; actor, director and TV personality Sebastian Goder, as well as the director and owner of the Montessori Biberkor school. 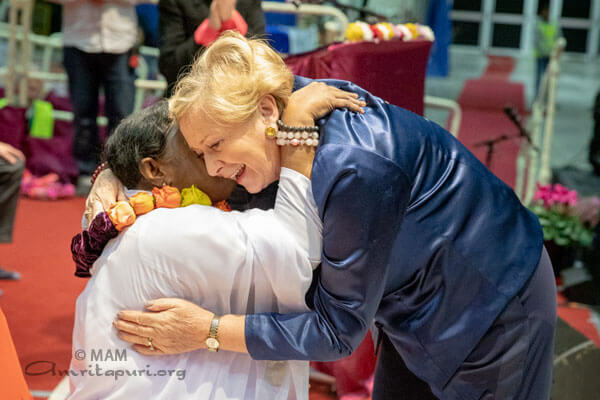 Amma’s visit was well covered by the media, including the newspapers Suddeutsche Zeitung, BILD Zeitung and Starnberger Merkur, as well as national television and radio stations. 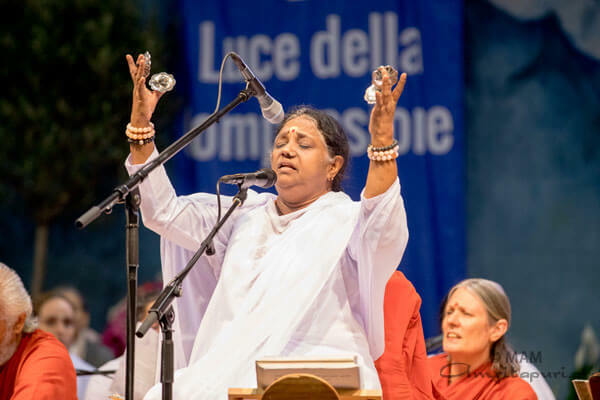 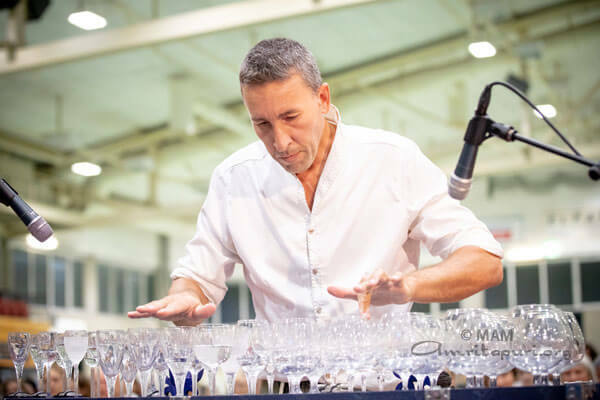 Amma’s programs in Munich are always marked by spellbinding classical musical performances, and this year was no exception. 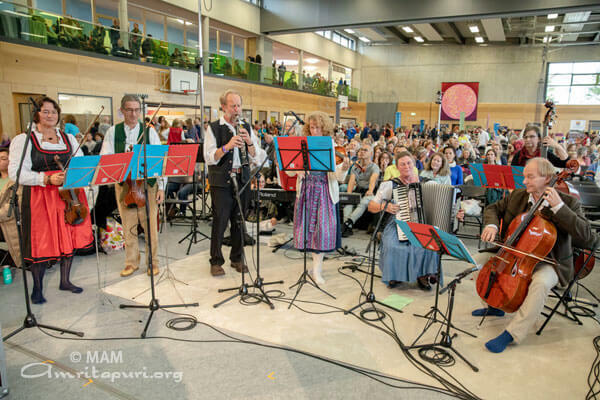 Being in the heart of Bavaria, this year also saw a number of traditional folk music performances. 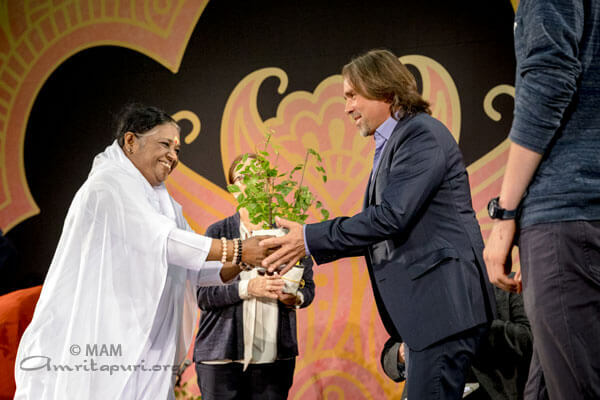 As a part of AYUDH’s Trees for Peace campaign, Amma blessed saplings, which were handed by the local dignitaries over to local AYUDH members. 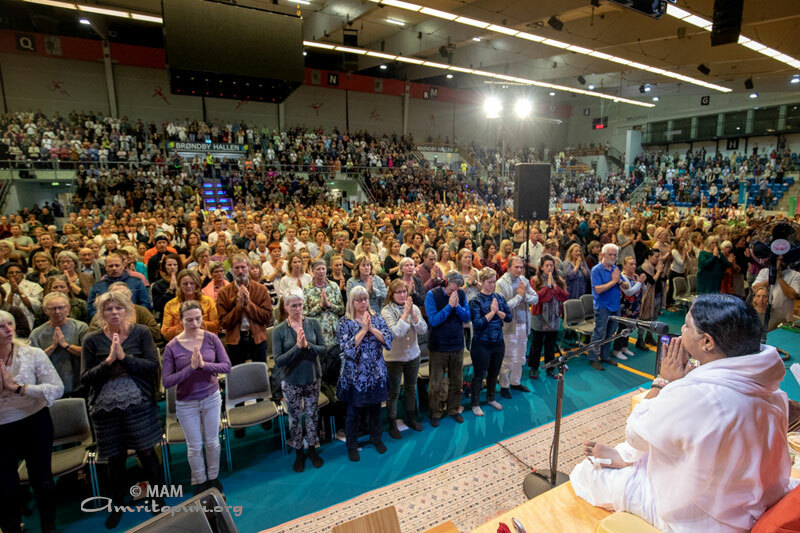 After years of patiently waiting, the dreams of countless well-wishers of Amma came true – Amma would come to Denmark for the first time. 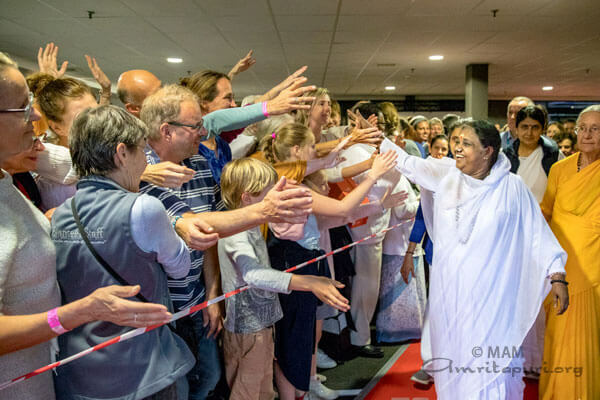 As Amma stepped out of her vehicle after a 14-hour drive from Winterthur, Switzerland, hundreds of her Danish children had gathered late into the night to welcome her as she first touched Danish soil. 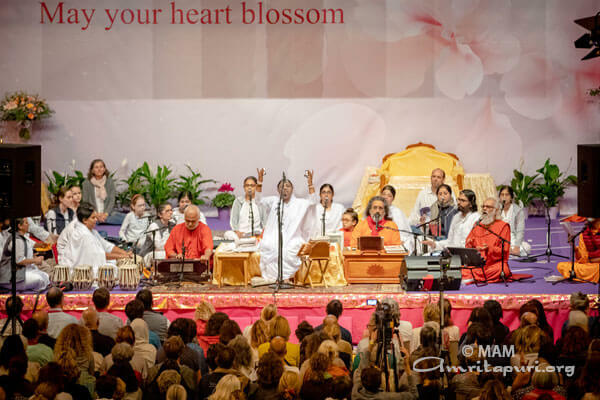 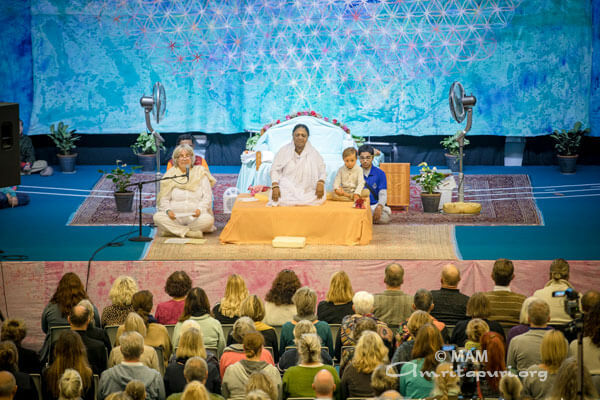 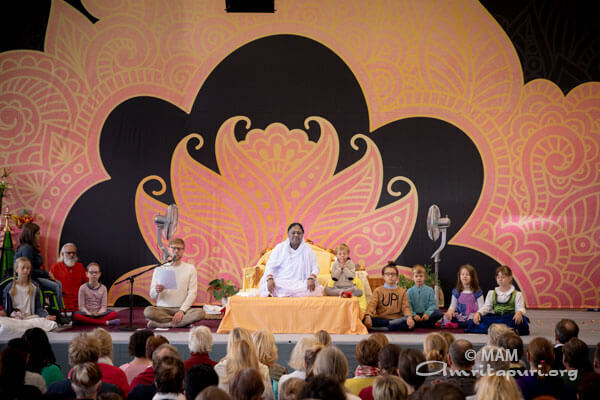 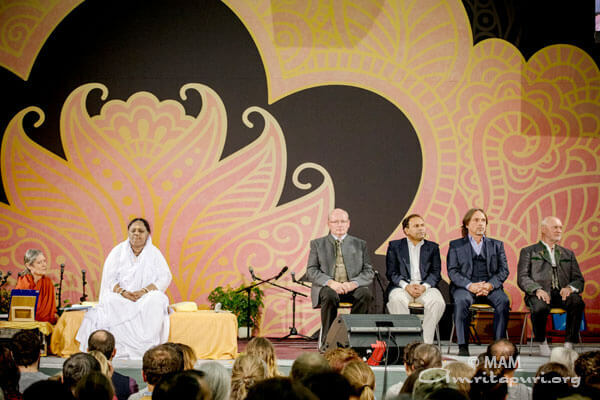 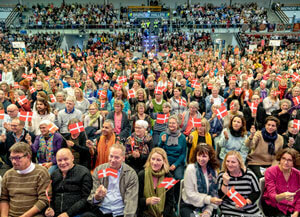 Amma’s first-ever program in Denmark was held in Brondby Hallen, the acclaimed sports arena. 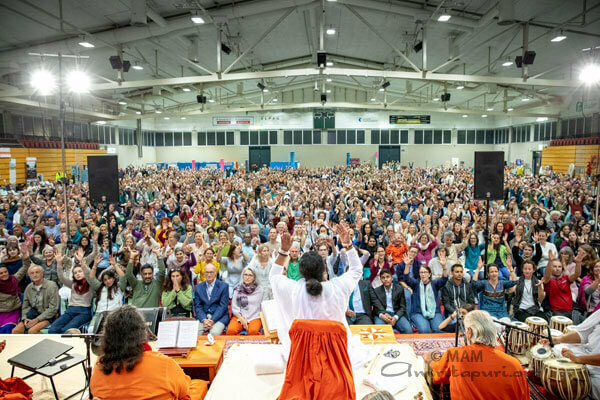 As it was her first visit to the country, even the day before the programs, no one knew how many people might be coming. 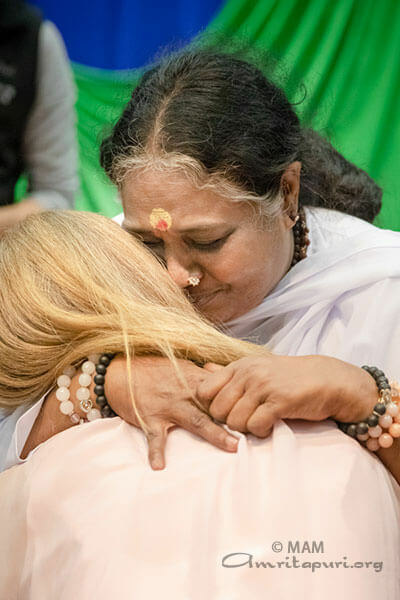 But even before Amma arrived on the first morning of her programs, the question was no longer whether people would come, but whether the arena could accommodate everyone who had come to receive Amma’s embrace. 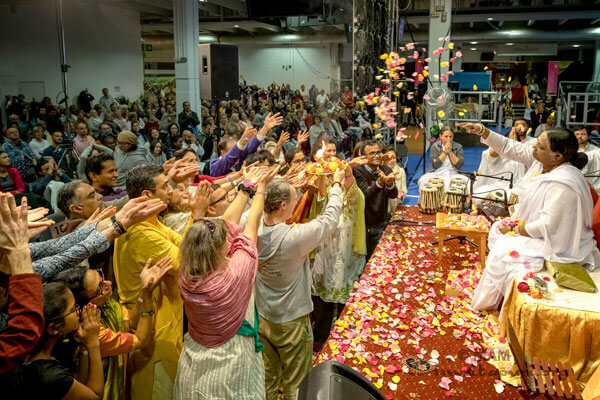 Brondby Hallen was transformed into a temple of love and peace. 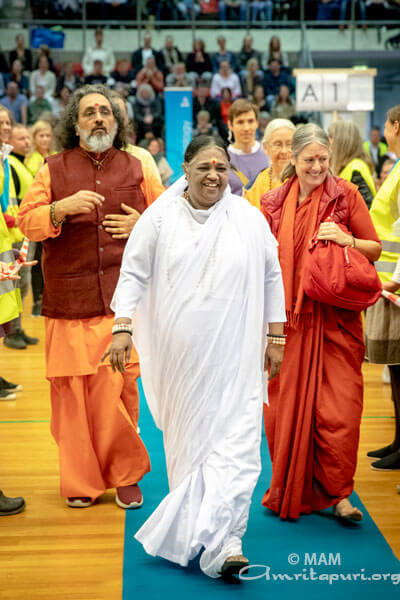 During the formal program on the first evening, Amma was welcomed to Denmark by Member of Parliament and priest, Ms Ulla Sandbaek and the Indian Ambassador to Denmark, Mr Ajit Gupte. 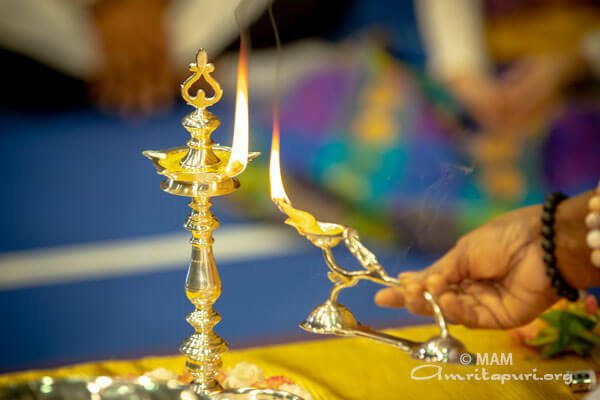 To all upon its way. 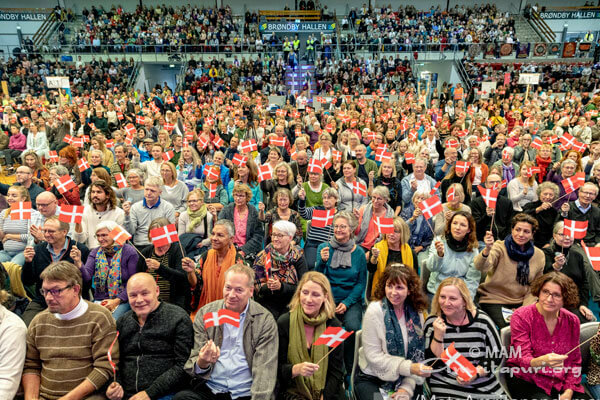 As the song came to a close, thousands of Danish flags appeared in the audience and waved with gratitude and celebration. 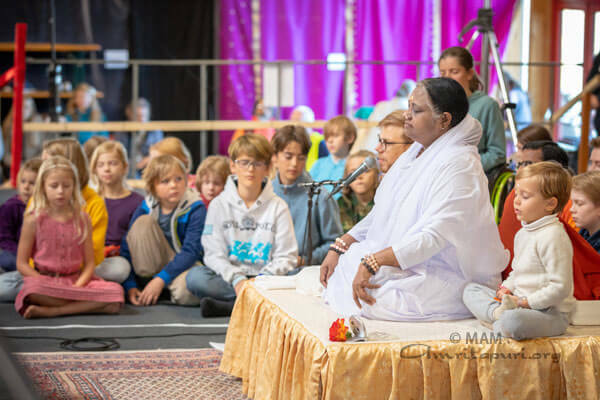 Despite the fact that it was Amma’s first ever program in Denmark, the program was very well organized, buoyed by the tireless efforts of Amma’s Danish children. 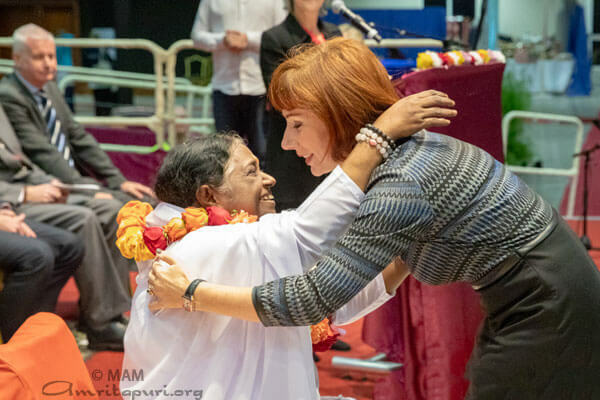 More than half of the volunteers who worked day and night to organize the program had never met her in person and would receive Amma’s embrace for the first time during her visit. 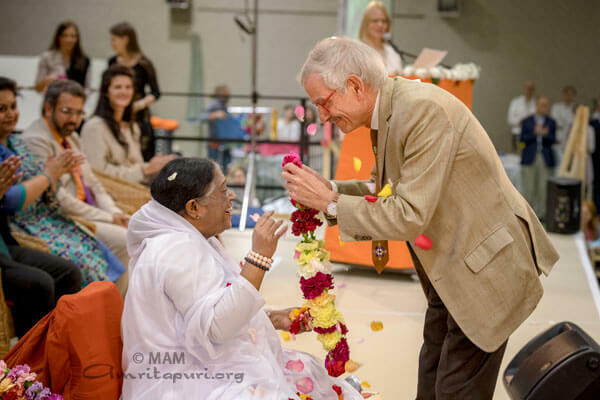 Amma’s visit was also well covered in the Danish media, including by Politiken, one of the top media outlets in the country. 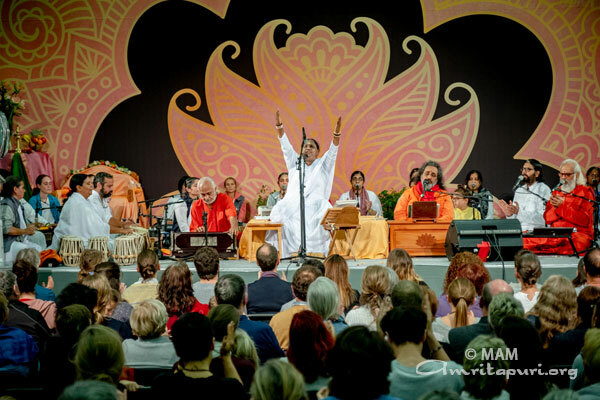 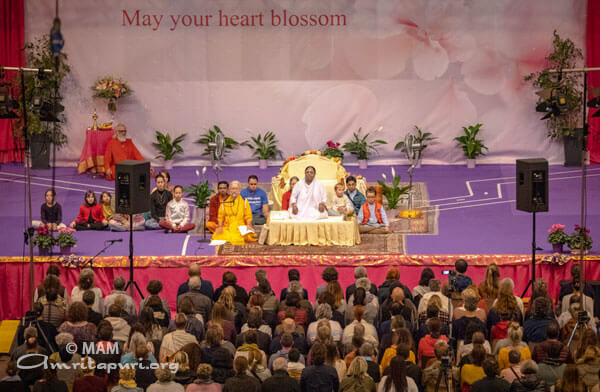 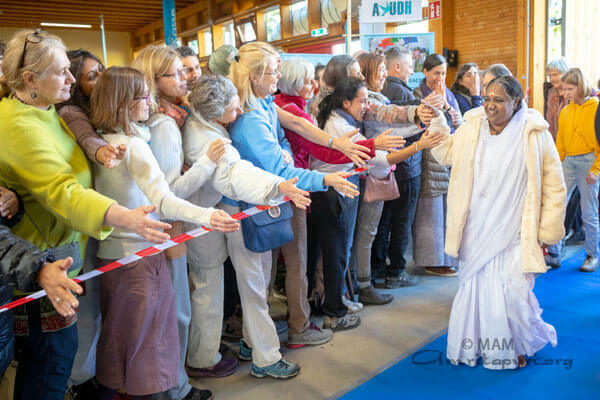 Amma arrived at Eulach Hallen, Winterthur to a grand welcome by the Swiss devotees, accompanied by the traditional Swiss alpenhorn and clanging of the traditional Swiss cowbells. 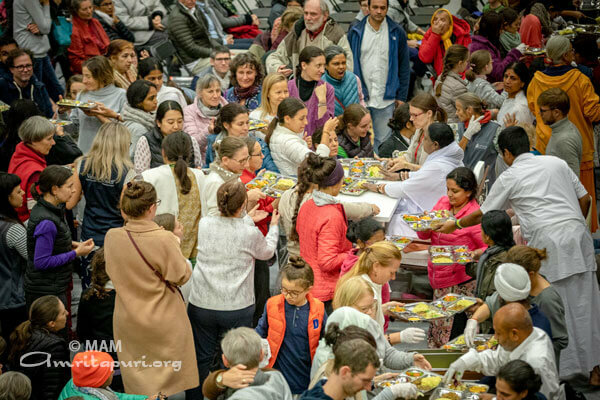 Upon her arrival, Amma served a prasad dinner to all the gathered volunteers and devotees. 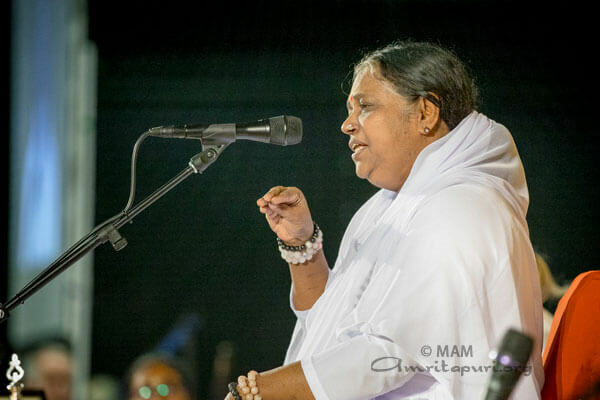 Being the Maha Navami day, Amma spoke that evening about the importance of Navaratri, highlighting the fact that only when the ego is obliterated can one attain real fulfilment in life. 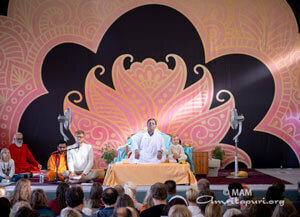 The sword of the Divine Mother represents the Knowledge which slays the ego, represented by the head of the demon. 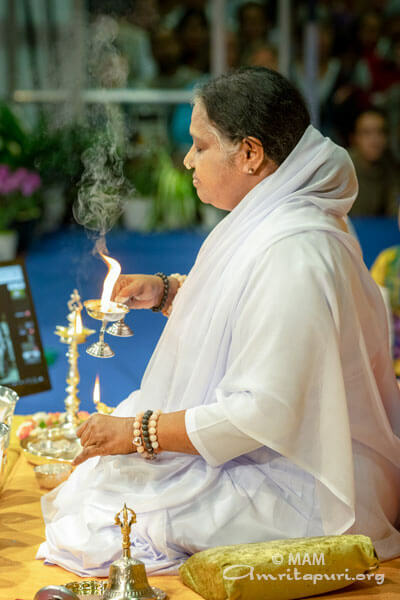 Amma explained that darkness is not an object that can be removed; rather, when you bring in light, it automatically disappears. 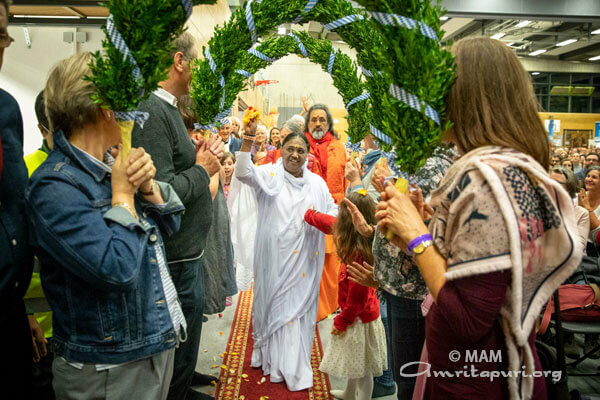 In a similar way, as you bring in the light of knowledge in your life, all ignorance will vanish and you can revel in the presence of the Divine Mother in your heart all the time. 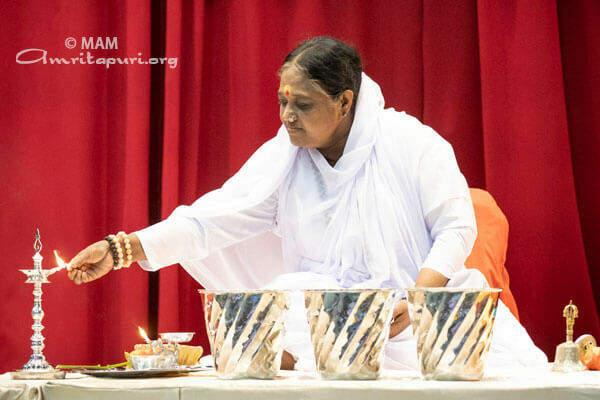 On the first morning of her programs, following the morning meditation, as per tradition on Vijaya Dashami, Amma led the initiation into writing, by tracing the letters Om Hari Sri Ganapataye Namah in a plate of rice. 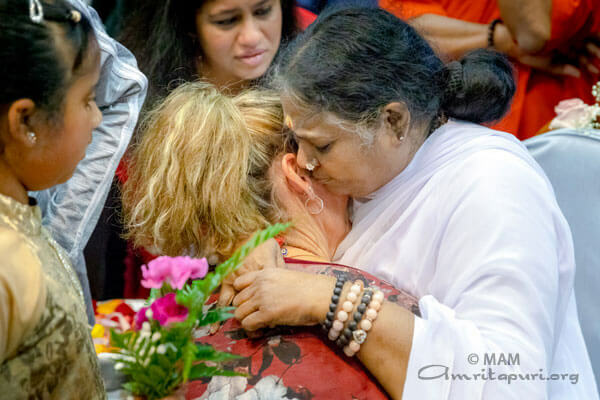 By video conference, her children in Amritapuri and other centres all over the world also participated and Amma interacted with them directly, initiating them from afar and calling to mind her declaration, “Where there is love, distance is not a barrier.” The love exchanged between Amma and her children all over the world as she gently guided them in the traditional invocation of Lord Ganapati’s blessings was palpable in every corner of the program hall. 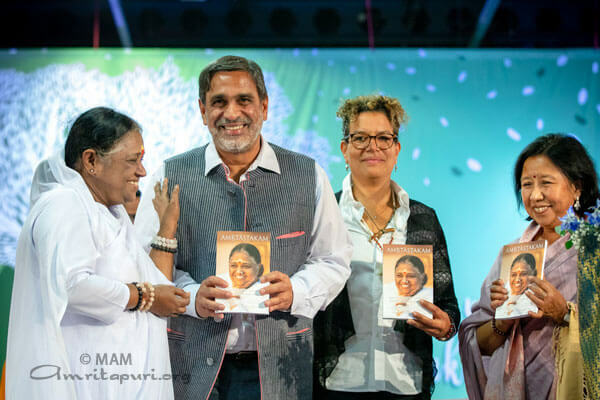 Amma was welcomed to Switzerland by Nik Gugger, member of Swiss Parliament and social entrepreneur; India’s Ambassador to Switzerland Sibi George; and Prof. Dr Michel Carton, former director of the Development Studies Institute in Geneva, former executive director and now senior advisor of NORRAG. 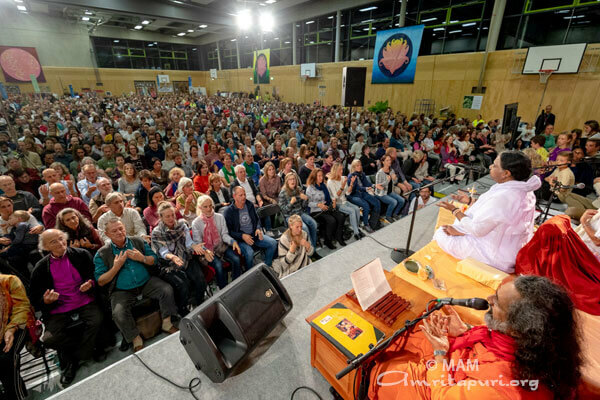 Amma’s presence attracted people from all parts of the country as well as the neighbouring countries of Belgium and Luxembourg. 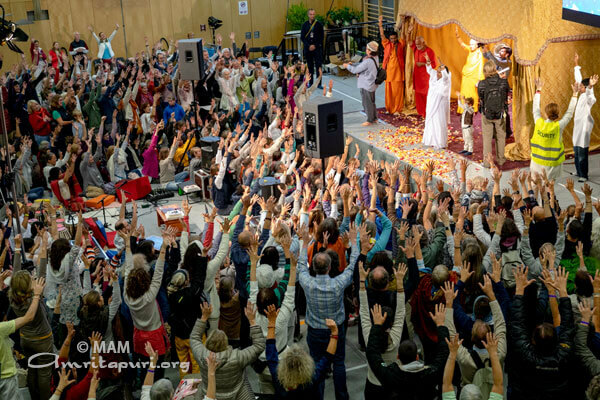 The Expo Houten venue had been overflowing on both days of Amma’s visit to the Netherlands. 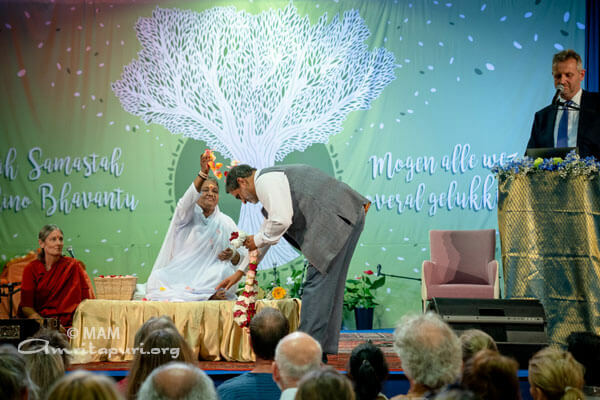 Amma was welcomed to the Netherlands by India’s Ambassador to the Netherlands, Venu Rajamony. 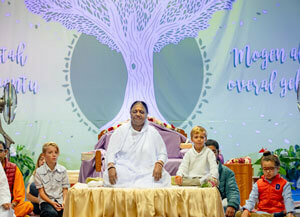 Mr Rajamony began by inviting the assembled crowd to themselves welcome Amma with a round of applause. 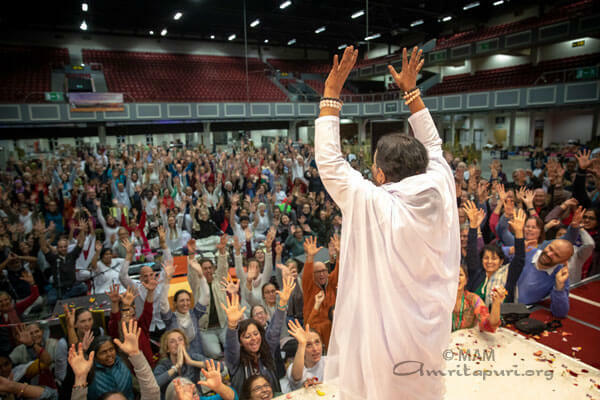 The crowd used the opportunity to express their appreciation for Amma, with applause that seemed as it would only end if they were asked to stop. 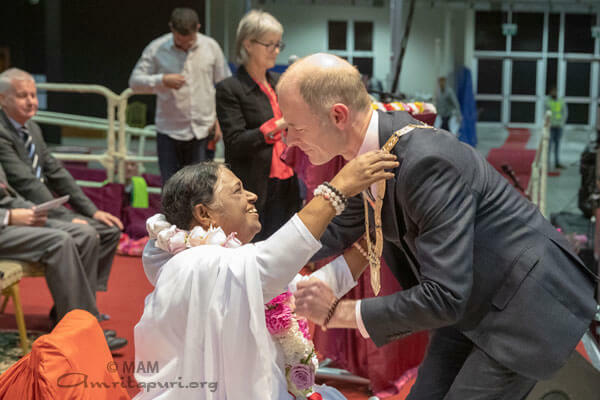 The devotees of Belgium brought Amma a special gift – in honour of Amma’s home state of Kerala, they performed the traditional Kerala dance kai kotti kali, dressed in traditional garb. 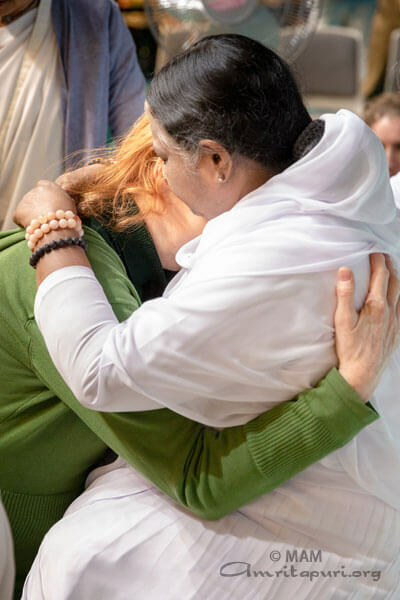 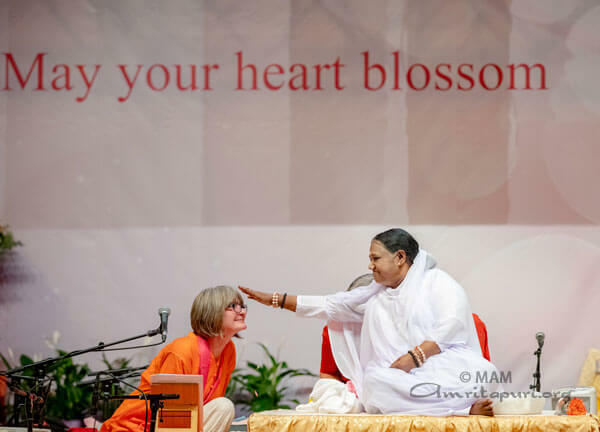 Their loving offering put on display for all to see and feel the truth that Amma’s love transcends all boundaries, and that Amma is fostering a new, universal culture of spiritual values. 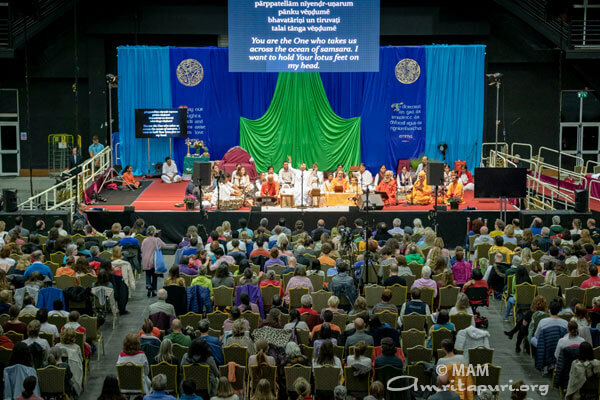 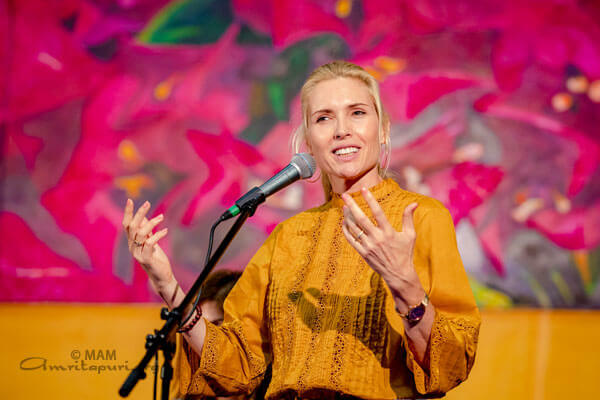 Devotees from all over the United Kingdom, Europe and even further afield flocked Ireland for her programs in Ireland this year, held at Dublin’s Citywest Convention Centre. 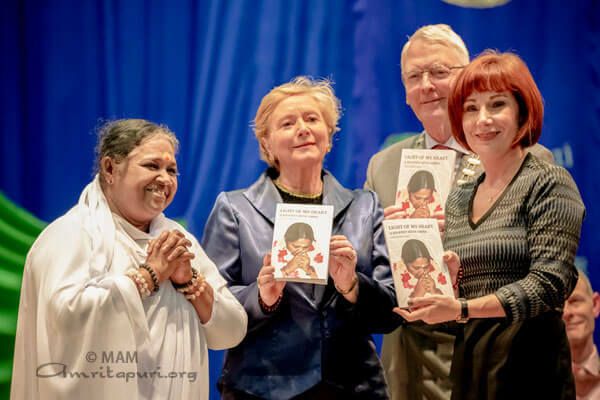 Amma was welcomed to Ireland by a host of government officials, including Ms Frances Fitzgerald, Ireland’s Minister for Business, Enterprise & Innovation; Ms Josepha Madigan, Ireland’s Minister for Culture, Heritage & the Gaeltacht; Mr Sean Crowe, Member of Parliament; Mayor – Cllr. 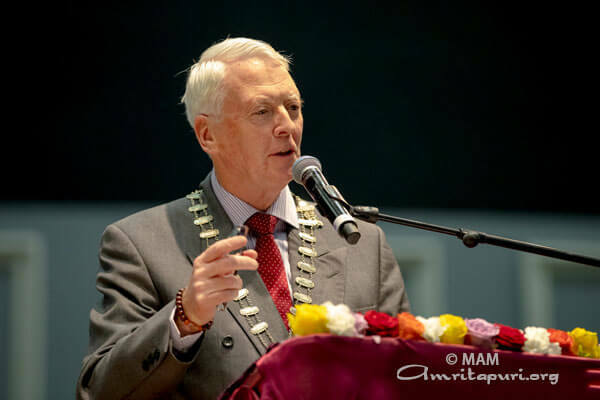 Mark Ward, South Dublin County Council; and Mayor – Cllr. 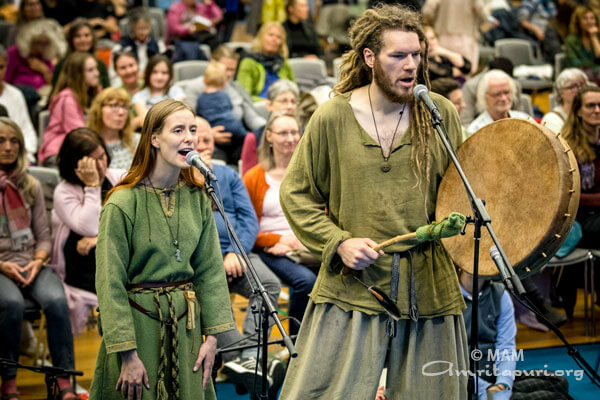 Ossian Smyth. 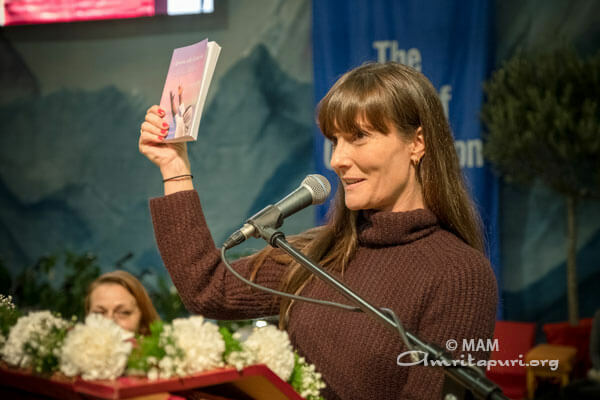 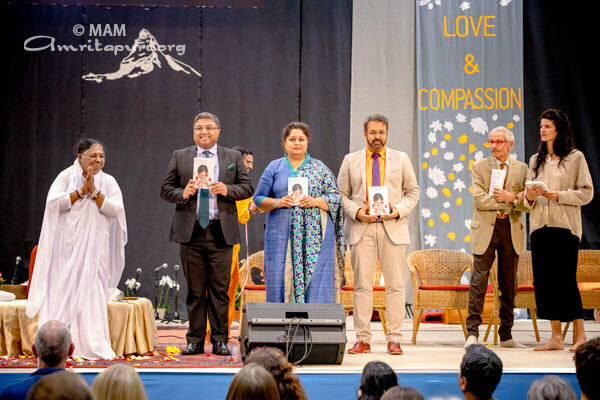 Two new books were released during Amma’s visit to Ireland: Light of the Heart, a memoir of living with Amma by Anna Dreier (Prabha); and Waves of Grace, a collection of devotees’ experiences with Amma. 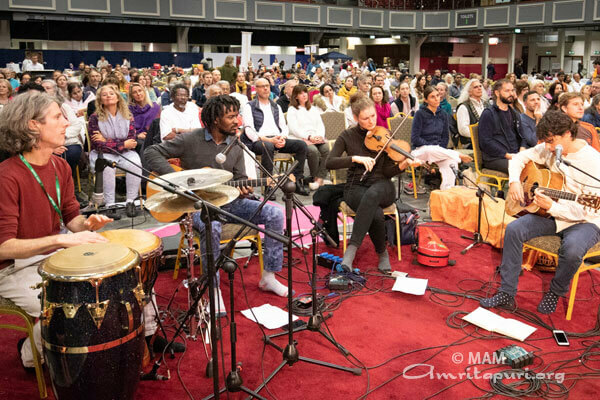 Like every year when Amma visits, the Irish people offered vibrant performances of traditional music, drawing on a rich heritage and ancient culture. 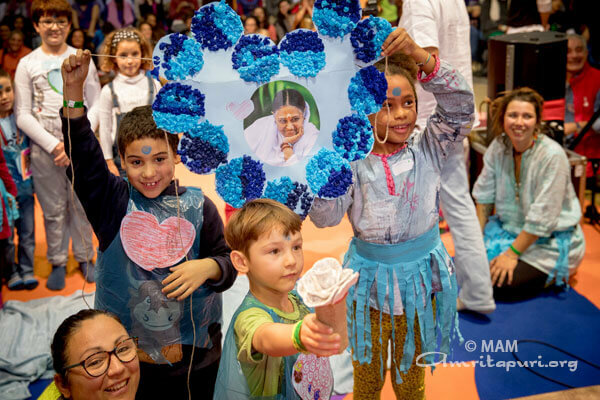 Granollers was the first stop of Amma’s 2018 European Yatra. 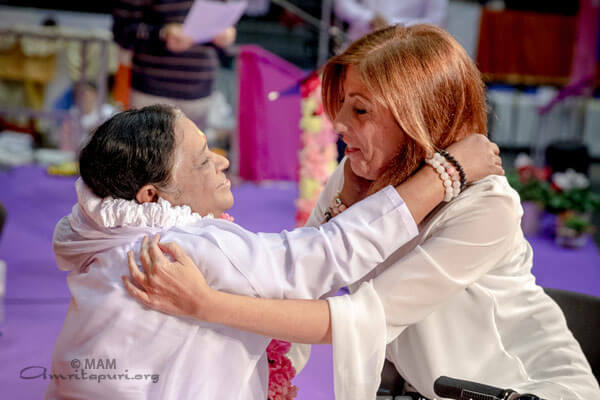 The evening of her arrival in Spain, Amma received a warm and rousing welcome from her children, who had gathered from all over the country to help organize the program. 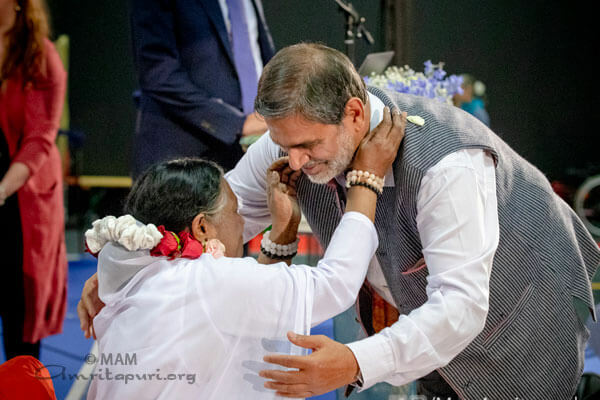 Amma was welcomed to the region by the Mayor of Granollers, Josef Mayoral, who expressed that he was delighted to have Amma back in Granollers after a gap of three years. 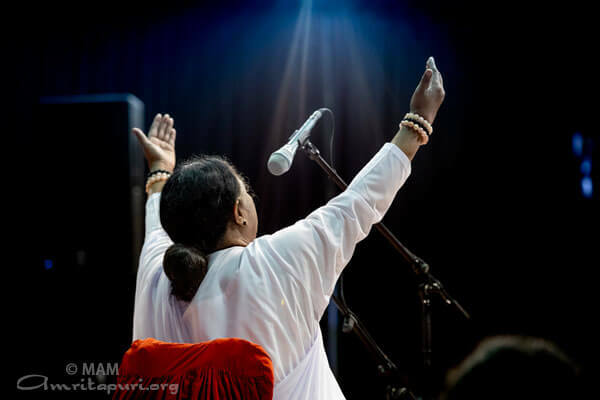 Amma gave darshan and Satsang on all 3 days, devotees participated in silent meditation and the prayer for world peace led by Amma. 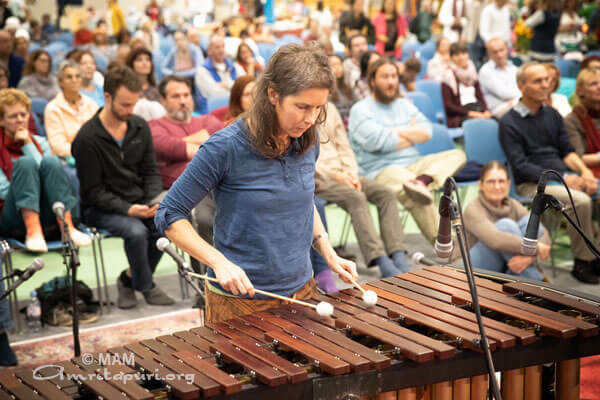 All three days were marked by beautiful and festive cultural performances drawing on local traditions, including a spellbinding presentation of the flamenco dance. 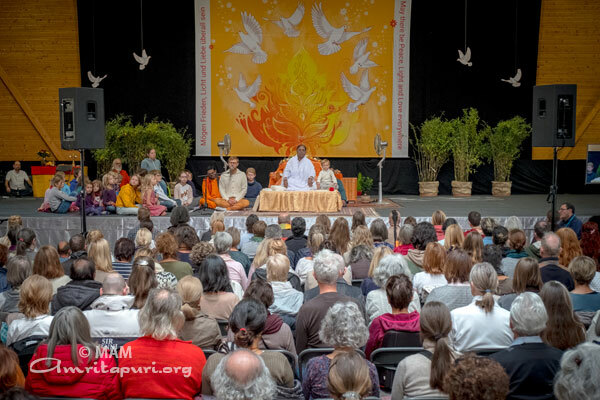 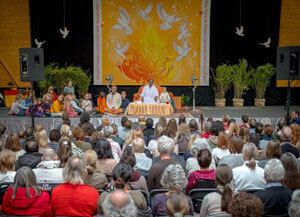 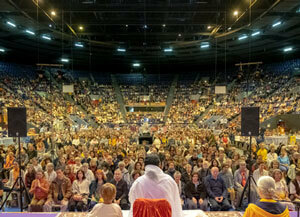 Before the Atma Puja on the final evening of programs, the Palua d’Esport Granollers was filled to capacity. 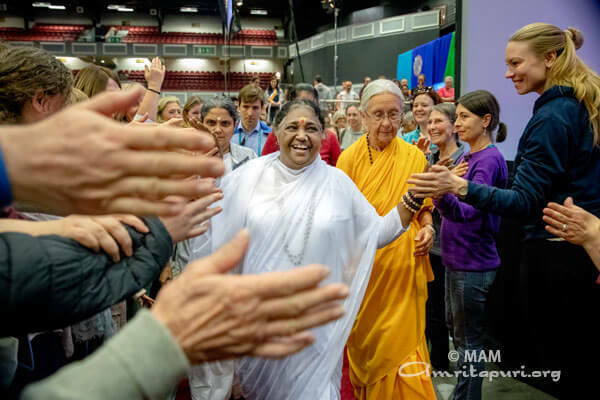 As has become a local tradition at Amma’s annual program, the stadium welcomed Amma with a wave. 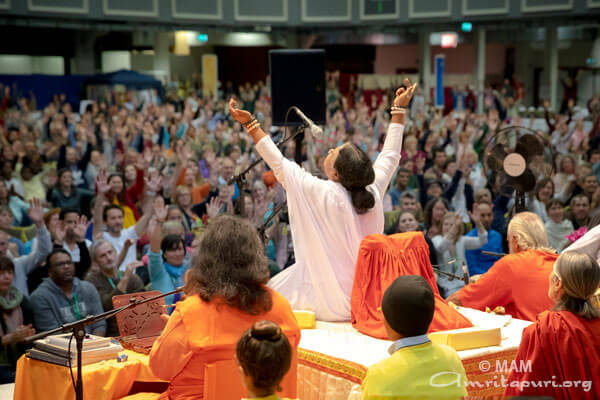 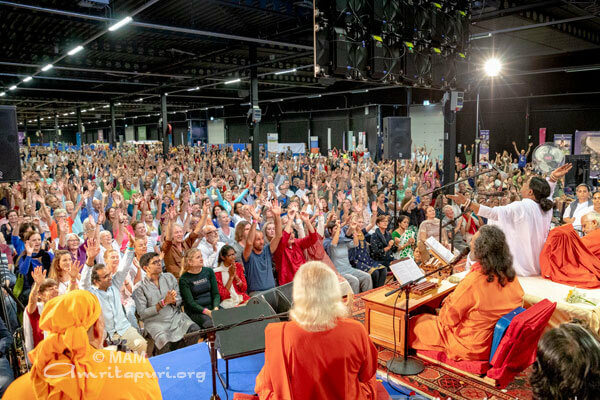 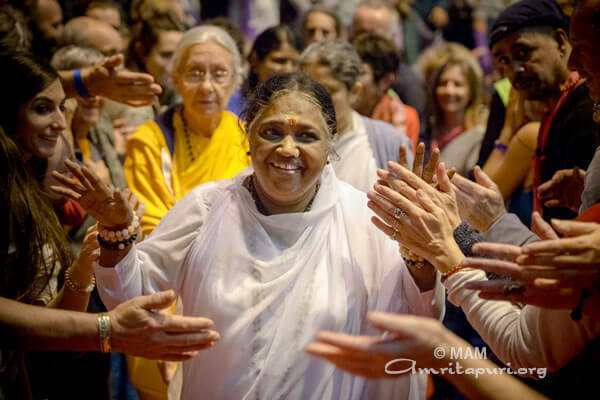 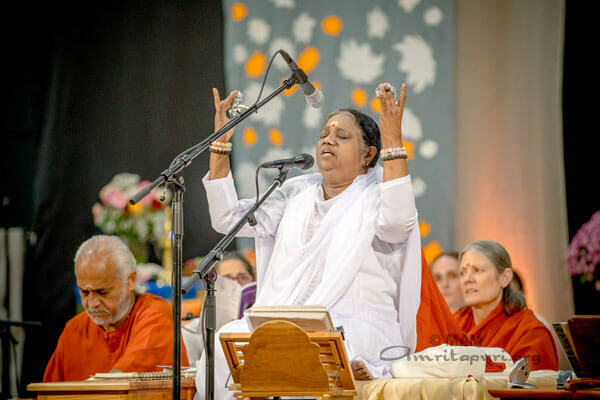 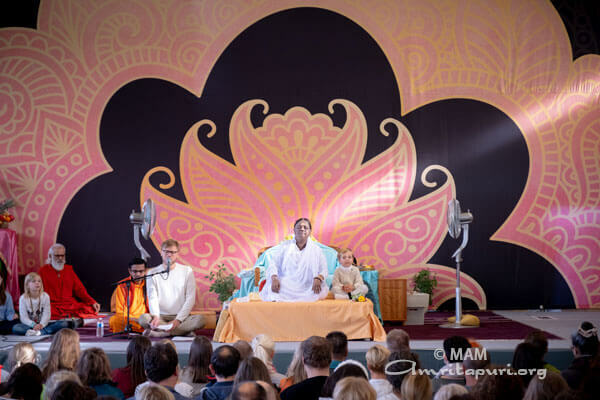 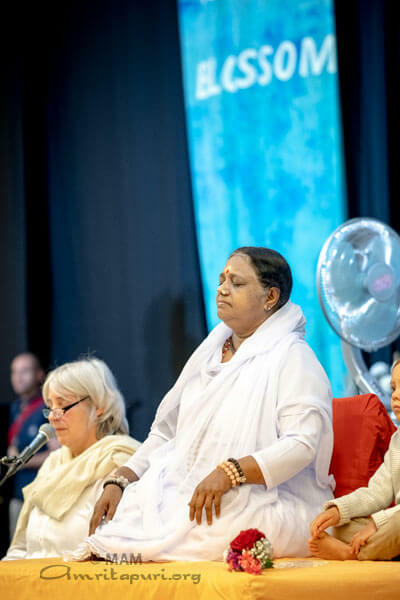 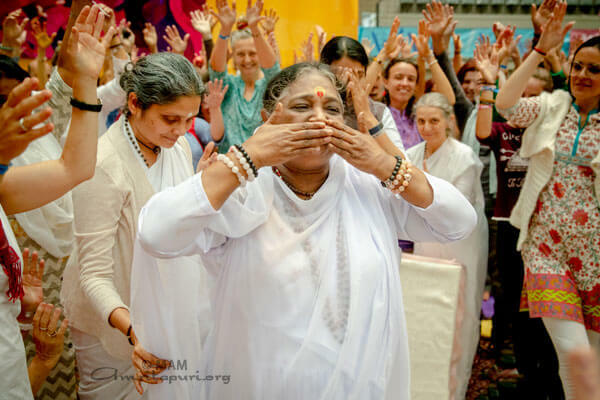 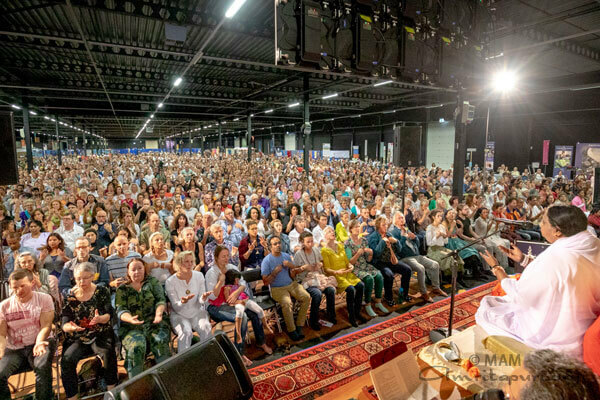 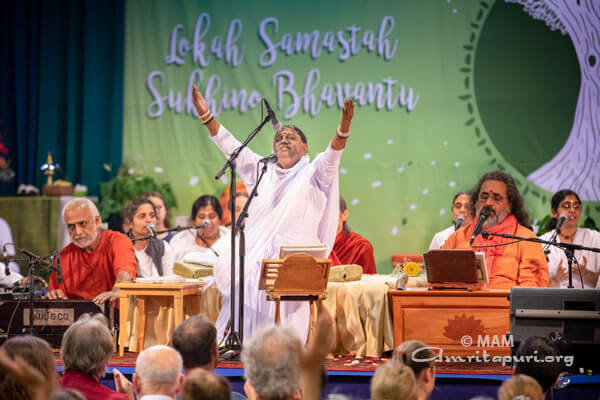 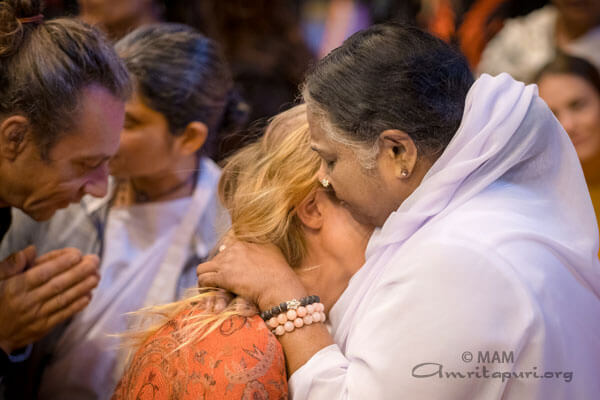 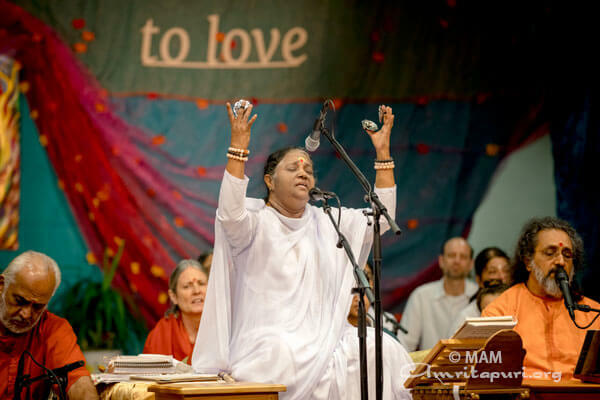 The sight of the devotees’ arms rising and falling in perfect synchrony and harmony called to mind the waves of love and compassion that had once again washed up on the shores of Europe with the commencement of Amma’s annual tour.